MINNEAPOLIS, Jan. 22, 2019 /PRNewswire/ -- The latest X-ray inspection system from Thermo Fisher Scientific offers the highest X-ray power available, enabling food manufacturers with difficult applications to easily detect a wide range of physical contaminants in large packages and dense, heavy products like cheese blocks, cases of spices and boxes containing various meat products. The system is designed for customers that must migrate to X-ray inspection for better performance compared to large aperture metal detectors or to satisfy a customer mandate to upgrade to X-ray inspection. The Thermo Scientific Xpert Heavy Duty (HD) X-ray Inspection System has 900W of X-ray power versus many other systems that operate with 100-200W. It is specifically designed with a large aperture width and height to accommodate big cases, boxes, bags and trays. The trapezoidal, top down X-ray beam is 770 mm wide at the belt and 525 mm wide at the 300 mm aperture height. It has an enhanced mechanical design to stand up to daily washdown and a water-cooled ceramic X-ray tube for long life. 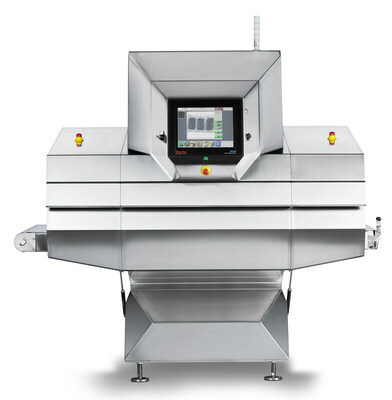 By delivering high penetration of food products in difficult applications, the Xpert HD is designed to support the highest level of food safety and brand protection. "The Xpert HD is one of the highest power X-ray systems in the world and is designed for challenging applications," said Bob Ries, lead product manager, metal detection and X-ray inspection for Thermo Fisher Scientific. "The typical applications are where the product has high product effect in a metal detector resulting in reduced sensitivity, or when the customer must be able to detect non-metallic contaminants." For more information on the Thermo Scientific Xpert Heavy Duty X-ray Inspection System, please visit www.thermofisher.com/XpertHD.